“It’s too late,” I scolded myself out loud as I was doing my morning walk. I normally walk at a much earlier hour. Sweat was running down my brow to my chin. I wiped it off thinking, “This heat and humidity is so high, I made a mistake by going too late.” There were no other walkers on the path, because they had been smart, and went during the cooler hours. All the usual friendly faces I greet were nowhere to be seen. I was alone and miserably hot thinking, “If I pass out from the heat, no one will even know.” It was not comforting. 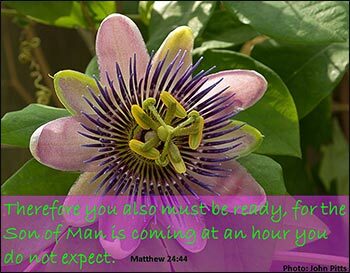 The Bible also tells us that when this time comes, it will be quick, in a moment or the twinkling of the eye. We must be ready. It’s not that we need to be physically awake, but we need to be spiritually awake, alive, and ready. How can we become spiritually alive, and get ready for this day? The solution is easy; accept the fact that Jesus is the son of God, who came and willingly gave his life, so that we personally could have forgiveness of our sins. Take time to go to the Lord in prayer, accepting His gift of love. Ask Him to be your Lord, Master, and Savior. When we go to Him with a humble spirit, He is waiting with open arms. He does not say to Himself, “I don’t know? I think you are too bad. I’m not sure I want you? Clean up your act first, then I’ll think about it.” He loves us just the way we are. No need for us to change before we come to Him. He will do all the changing for us. It is His glorious gift. Then when that day comes, you will be ready. You will be taken to be with Him. You will not be walking the path of life alone without your loved ones, because you have been made ready. I did not enjoy walking that path this morning, because it was too late. Don’t wait until it’s too late in your life. Come to Christ today. Being left behind would be horrible.